The Afan Valley Bike Shed motto is to keep you riding, and with our extensive range of mountain bike goods and services, that's something we strive towards every day. With a team of experienced mountain bikers and mechanics, the Afan Valley Bike Shed is committed to showcasing the very best trails the Afan Valley has to offer while doing everything we can to keep you riding! Having ridden mountain bikes all over the world and experienced all types of mechanical failures, race successes and trail triumphs, our team has expert knowledge in all areas of mountain biking. Together, we're able to offer you our honest advice, our professional skills and a warm welcome when you stop by our shop. We've all been there, stuck on a mountain with a broken bike and desperate to get it fixed as soon as possible to avoid missing out the next day. This is why the Afan Valley Bike Shed can stay open later if needed so that if you come down the trail with a mechanical issue, we can get it fixed to keep you riding! Overnight servicing is also available, so if you’re staying in the Afan Valley for the weekend, you can drop your bike off, get it cleaned, serviced, and repaired ready for the next morning. This leaves you to enjoy a beer and a hot meal without the worry of having to try to fix your bike through the night. While your bike is with us, there's plenty of secure storage for added peace of mind. For more information on any of our services, feel free to contact us. Ben's commitment and passion for mountain biking have led him from his hometown of Portsmouth to the Afan Valley after spending a great deal of time guiding groups on epic rides through the Alps and organising Megavalanche riding holidays. The Afan Valley Bike Shed was born in 2012 when it was only known as the "Bike Shed", because that's where it all began, from his garden shed. Since then, the garden shed has grown, moved and evolved into a renowned mountain bike hub in the heart of the Afan Valley. 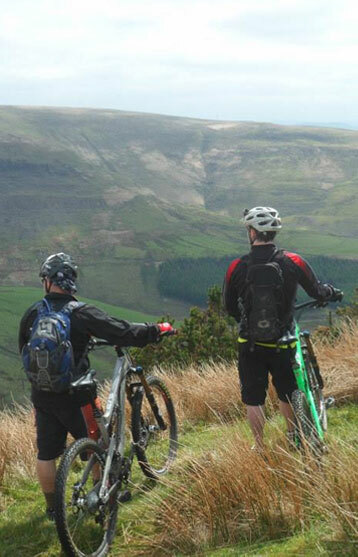 Ben is a qualified British Cycling Level 3 MTB Guide, Level 2 Coach and Scottish Mountain Bike Leader and has a real passion for exploring exciting new routes for Afan Off-Piste. With a Level 3 Cytech qualification and over 20 years of experience in the mountain bike industry, Ben is a fountain of knowledge for all your MTB queries. Emma works part-time on the shop floor at the Afan Valley Bike Shed offering expert advice and a warm welcome to everyone. Working towards her British Cycling MTB Leadership Level 2 award, Emma also holds qualifications in British Cycling Level 1 Ride Leader and a bronze for the National Navigation Award Scheme. She plans to encourage mountain bike participation to women and young people, by helping to build the Afan Valley Bike Shredders club, and by getting involved with women's specific events. When she's not in the shop, you can probably find Emma shredding the many off-piste trails that Afan has to offer. With a wealth of professional experience working in the financial industry, Vicki prides herself on customer service and her desire to help whenever possible. While Vicki focusses on the family side of the business, looking at all the options available for young riders and how the Afan Valley Bike Shed can cater to their needs, she also oversees the general day-to-day running of the shop. With two young children of her own, Vicki is excited to get them confident on the bikes so they too can enjoy mountain biking in the Afan Valley with her. The next step for Vicki is to become a Bikeability instructor so that she can inspire the next generation of mountain bikers. Our guides can take you over hills and dales, up and down valleys, through streams and farms where you can take in the changes in the dramatic Welsh scenery.